Thanksgiving costumes for children & adults at Etoile Costume & Party. Pilgrim and Indian costumes for kids and adults. Even a turkey costume! Paper goods, greeting cards, candles and hostess gifts for Thanksgiving, too. The ancient Greeks worshiped many gods and goddesses. Their goddess of corn (actually all grains) was Demeter who was honored at the festival of Thesmosphoria held each autumn. On the first day of the festival married women (possibility connecting childbearing and the raising of crops) would build leafy shelters and furnish them with couches made with plants. On the second day they fasted. On the third day a feast was held and offerings to the goddess Demeter were made – gifts of seed corn, cakes, fruit, and pigs. It was hoped that Demeter’s gratitude would grant them a good harvest. The Romans also celebrated a harvest festival called Cerelia, which honored Ceres their goddess of corn (from which the word cereal comes). The festival was held each year on October 4th and offerings of the first fruits of the harvest and pigs were offered to Ceres. Their celebration included music, parades, games and sports and a thanksgiving feast. The Ancient Chinese celebrated their harvest festival, Chung Ch’ui, with the full moon that fell on the 15th day of the 8th month. This day was considered the birthday of the moon and special “moon cakes”, round and yellow like the moon, would be baked. Each cake was stamped with the picture of a rabbit – as it was a rabbit, not a man, which the Chinese saw on the face of the moon. The families ate a thanksgiving meal and feasted on roasted pig, harvested fruits and the “moon cakes”. It was believed that during the 3 day festival flowers would fall from the moon and those who saw them would be rewarded with good fortune. According to legend Chung Ch’ui also gave thanks for another special occasion. China had been conquered by enemy armies who took control of the Chinese homes and food. The Chinese found themselves homeless and with no food. Many staved. In order to free themselves they decided to attack the invaders. Sukkoth is know by 2 names – Hag ha Succot – the Feast of the Tabernacles and Hag ha Asif – the Feast of Ingathering. Sukkoth begins on the 15th day of the Hebrew month of Tishri, 5 days after Yom Kippur the most solemn day of the Jewish year. Sukkoth is named for the huts (succots) that Moses and the Israelites lived in as they wandered the desert for 40 years before they reached the Promised Land. These huts were made of branches and were easy to assemble, take apart, and carry as the Israelites wandered through the desert. The ancient Egyptians celebrated their harvest festival in honor of Min, their god of vegetation and fertility. The festival was held in the springtime, the Egyptian’s harvest season. The custom of an annually celebrated thanksgiving, held after the harvest, continued through the years. 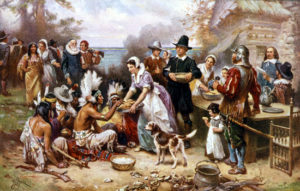 During the American Revolution (late 1770′s) a day of national thanksgiving was suggested by the Continental Congress. Thanksgiving in Canada is celebrated on the second Monday in October. Observance of the day began in 1879.